Because so much happened during our Marrakech trip, I decided to split this post into two separate ones, and tell you about how we ended up having a day trip to Essaouira. If you’ve read my earlier Marrakech post, you’ll have read that Andrew and I came up with a grand plan, that wasn’t quite sound so feasible once we’d worked out the logistics…once the two of us had got over the fact that we wouldn’t be making the 12-hour round trip to Chefchaouen and Nipon had rolled his eyes at us – yeah, I know, we got way too excited with our idea – we settled on having a day to Essaouira. And, it was so much fun. We found ourselves with an easy-going driver, Abdul and in his willingness to drive us, he also got our humour, chatted away to us and even laughed at our jokes. The drive was around 2 ½ - 3 hours, so it was just as well he found us funny, it was going to be a long drive otherwise, we chat a lot! Our drive took us through so many little villages and towns, and we saw so many interesting snippets of local life, and so many photo opportunities. Lorries packed so high with hay or some form of fruit. We even saw a guy riding his motorcycle with a crate of fresh eggs balanced on his head. Like, how did he do that without breaking one? I’ve always wanted to shout ‘stop, the car’ and that’s exactly what the three of us said to Abdul as we passed tree goats in Argan trees. I never entirely believed this to be true, even though I’ve seen photos of this rare sight, but it’s real alright. These are not your normal, pasture-grazing goats. These animals climb on top of the Argan trees that can measure 26 to 33 feet high to graze on the fruit. Amazing, right? these trees are also where Moroccan Argan oil comes from. After the goat excitement and more giggles with Abdul, we arrived in Essaouira. Abdul gave us our pick up point and off we went. We headed straight to the fishing port. 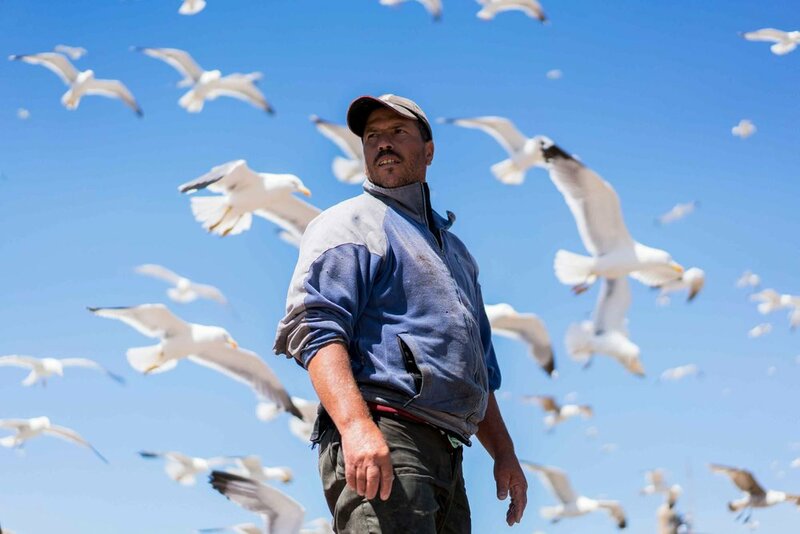 I love a good fish market, but wow, nothing prepared me for the thousands and thousands of squawking seagulls swooping down on the fishermen. I’ve never seen anything like it, and it wasn’t an opportunity that I was going to miss capturing with my camera…even if it meant I might get seagull pooped on. And, yes, I did get pooped on, three times! We had a quick wander of the fishing port itself watching the fishermen shouting to each other, gutting their fish in their haste to offload their catches. The smell of fish permeated the air as cats sniffed around. It’s where you’ll find locals mending fishing nets and constructing traditional boasts, and where you’ll be able to snap a view of the fortified city from afar. We had a little incident where Andrew got chased by a fisherman wielding a knife, a reminder that not everyone likes their photo taken, and then we met a lovely friendly guy who happily let us snap him, so you really do have to be aware and be open to the locals. We then headed into the city walls to explore the cobbled streets. I’m not a Games of Thrones fan, but Essaouira’s claim to fame is having been a filming location for series 3. I think the three of us just loved walking through the streets stopping when something caught our eye. The main street was a great people watching experience. Old and young men alike just chilling in carts or sipping Moroccan tea. We made friends with a couple of shop sellers who offered Andrew and Nipon some camels to keep me and then stopped to rest at a cute café for mint tea and biscuits. I’ve never drunk more mint tea than I had whilst in Marrakech. In a country where ‘having a beer’ is not a thing, locals substitute pot of mint tea. There’s a fine art to pouring mint tea too; the higher the teapot, the better. 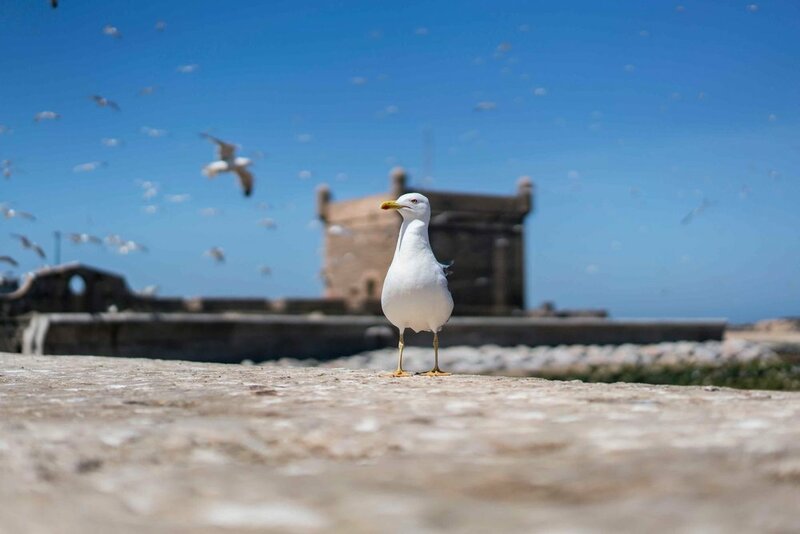 Essaouira is pronounced ‘es-sweera’ and it is considerably more relaxed and unhurried in comparison to the maze-like streets and madness of Marrakech. It doesn’t have the same visitor numbers or quite the same souks or streets. A total difference and it made for a beautiful wander. It offered up a refreshing and somewhat bohemian escape. Houses are painted a fresh white and blue, there’s a cool sea which makes sense as it’s known as ‘the windy city of Africa. The beaches here are a mecca for surfer and windsurfers. The medina – a Unesco World Heritage Site – is pedestrianised, and the souks are a joy to explore. Nipon and Andrew decided to both try on djellabas which they’d both been exclaiming looked cool and comfortable, and we didn’t feel harassed into buying. Everything just felt chilled! People seemed more content here. They’re not hustling, and they’re happy to talk to you. Maybe it’s the seaside vibe, or the cultural influence (Portuguese, Berber, Jewish, Dutch and French), or the romantic artsy-hippy vibe - whatever it is, it’s as chilled as it is unique and we loved it. You can’t help but feel a sense of peace. We lingered until the sunset, deciding to grab some freshly baked Moroccan bread, olives, cheese and I’d been addicted to Moroccan dates since arriving – and we sat watching the sunset, waves crashing against the ramparts, people-watching and eating before heading back to the hustle and bustle of Marrakech.